The American Health Council is delighted to welcome Ms. Elizabeth Takyi onto the Nursing Board in recognition of her dedication and commitment to the healthcare industry. Drawing on over 15 years of service, Ms. Takyi is a highly experienced and skilled registered nurse, who is well respected by both colleagues and patients alike. Throughout her education and training, Ms. Takyi was extremely privileged to have excellent instructors to guide her, in addition to having a great support system from family members and colleagues, who always encouraged her along the way. This unwavering support enabled Ms. Takyi to work towards making her dream career a reality. Ms. Takyi decided to become a registered nurse after having a fantastic experience during her employment at a nursing home in 2009. Possessing a natural talent for looking after vulnerable people, she was acknowledged during her time at the nursing home for her dedication to helping prevent residents from falling. Currently working in Abbott Northwestern Hospital as a registered nurse and specializing in Geriatrics, Ms. Takyi’s daily responsibilities include working in the vascular unit, seeing patients with vascular issues (aneurysm, blood clots, amputations, strokes diabetes, kidneys, etc. ), transporting patients from the ICU to recovery, and assessing patient recovery statuses. Abbott Northwestern Hospital is a 627-bed teaching and specialty hospital based in Minneapolis, Minnesota founded in 1882 for Women and Children. It is the largest not-for-profit hospital in the Twin Cities and a part of the Allina Health network of hospitals and clinics. U.S. News ranked Abbott Northwestern among America’s Best Hospitals with six adult specialties ranked in the top 50 in the United States. The hospital offers a wide range of services for its patients, including Mental Health Services, Cardiovascular Care, Geriatrics, Orthopaedics, Rehabilitation, Neuroscience, Spine, Surgery, Women’s Health, Cancer Care and Pediatrics. 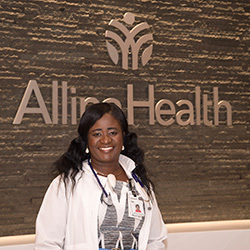 To expand her knowledge and maintain her understanding of nursing, Ms. Takyi is a member of several professional associations including the Minnesota Nursing Association and Sigma Theta Tau. Being a member of Sigma Theta Tau is also a professional honor for Ms. Takyi. In addition, Ms. Takyi’s personal achievements include being recognized with high honors while pursuing her bachelor’s degree in nursing. A particular career highlight for Ms. Takyi was being recognized as ‘Best Employee of the Year’, and as a further recipient of patient recognition awards, the esteemed professional is extremely humbled by the accolades she has received. Ms. Takyi’s goals within the next 5 years include pursuing her NP certification and to continue her work with underprivileged communities. Ms. Takyi is already pursuing her career goal in the FNP/DNP program, and is one and half years through the four years program. In her spare time, Ms. Takyi enjoys travelling, exercising, reading, and watching movies, and spending good time with her family. She also volunteers as a teacher of adult education, which she finds extremely rewarding. Abbott Northwestern Hospital is a 627-bed teaching and specialty hospital based in Minneapolis, Minnesota founded in 1882 for Women and Children. It is the largest not-for-profit hospital in the Twin Cities and a part of the Allina Health network of hospitals and clinics. U.S. News ranked Abbott Northwestern among America’s Best Hospitals with six adult specialties ranked in the top 50 in the United States.